It is not quite August and already the stores are ready for “Back To School”. The following was sent to us from our US counterparts and is worth sending on to you. Note however that in Nova Scotia most if not all school boards have been using less toxic cleaning materials for at least a decade. It pays to be aware though and make sure this continues. Also to make sure more toxic products are not brought from home. Micro-fibre cleaning cloths are reducing the need for even the less toxic cleaning chemicals. Q1. Would you like to help your school save money this school year? Q2. 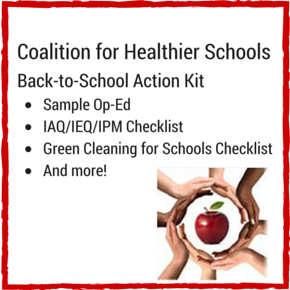 Would you like children, teachers, and other staff to stay healthier this school year? If you answered yes to either Q1 or Q2, then you will want to know more about using green and healthy products inside schools. Maintaining a healthy learning environment is an important part of making sure that every child can learn. But all too often, conventional products—from computers to paints to cleaning supplies—expose school occupants to toxic chemicals that can pollute the indoor air. Children and staff who can’t concentrate or miss school or are uncomfortable in class will not succeed this year. Fortunately, reducing toxic chemicals in products will reduce air pollutants inside schools and thus will benefit all occupants. There are a few ways you can help your school use a wide range of greener products. Select nontoxic (low emission) school supplies, such as nontoxic markers and pens, and notebooks and binders made without PVC plastics. Select EPEAT-rated electronics to minimize toxic chemicals, reduce the disposal costs of outdated electronics, and save on energy. (EPEAT is a certification system for greener electronics). Do not send cleaning or disinfecting products from home to school to use in classrooms. 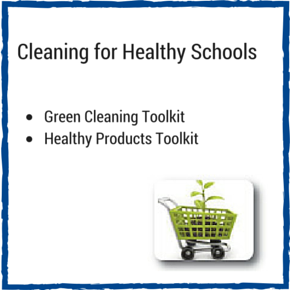 Ask your local school if it is using money-saving, third-party certified green cleaning products (reliable certifiers are Green Seal (US) and UL-E (EcoLogo). If your school is already using green products, those can be diluted with plain water for wiping up sticky spills in classrooms. Ask your local school if it plans to do any interior painting in the coming year, and if so, ask it to buy low-emission, third-party certified interior wall or ceiling paints. These will help reduce indoor air pollutants. There are many resources and tip sheets to help you get started on reducing chemical hazards inside schools. There are lots of other great articles on our website. Visit us often.